There has been a long time lapse since the last update – apologies for that. This is a quick update and will be followed in the next two weeks with latest news and also comment on transport issues in Hastings, Bexhill and the wider county. The saga of the BHLR continues. With the county council website behind events and still displaying information on the 10k running event for the 20th September, we have since seen elsewhere in the news revelations of delay, apologies, blame and staggering multi-million pound costs increases. All of this is, of course, subject to confirmation and possible revision, and no details of frequencies of the proposed bus service were given. Will it happen on November 2nd? The recent televised apology for the delay made by county council leader Cllr Keith Glazier was tempered by an assertion that ‘protestor action’ had been a significant cause. 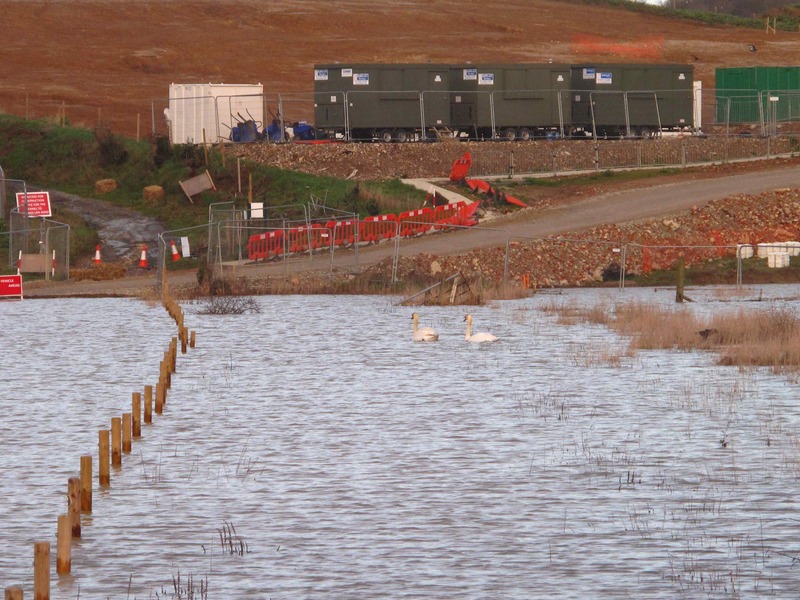 It may have delayed construction by a few weeks, but the years of delay are due to the mis-management of the scheme, with a gap of three years (2004-7) due to legally required consultation meetings with government ‘environment protection bodies’ to devise measures to mitigate (make ‘less worse’) inevitable environmental damage. 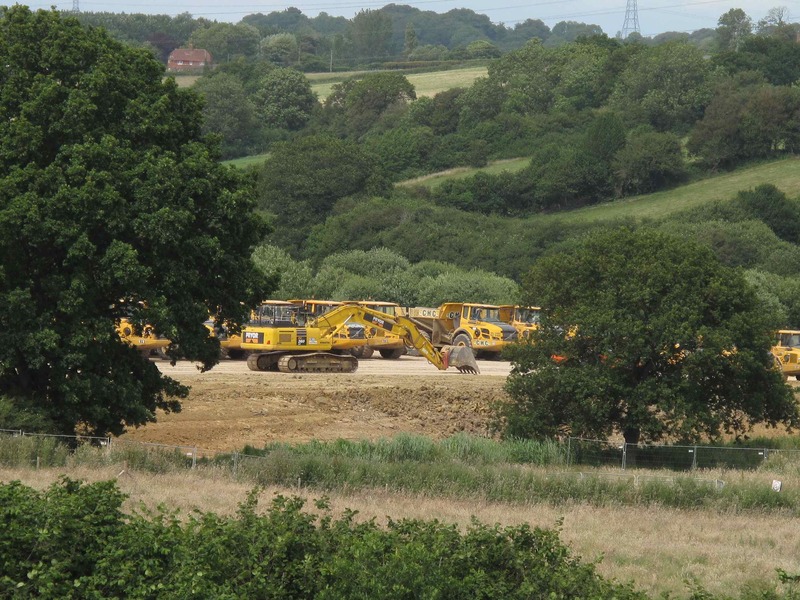 The meetings must have been less than effective, because all three government Statutory Environmental Bodies ( SEBs: Environment Agency, Natural England and English Heritage) raised serious doubts about the quality of the planning application for the Link Road scheme when it was submitted to the county’s own planning committee: the first two objected formally and the third raised questions about the size of the budget to conserve for the nation the archeological treasures already known, and those judged almost certainly present – but yet unknown – in the Combe Haven valleys. It took until 2009 to determine the planning application and then came the Public Inquiry late in that year. The inspector’s report didn’t appear for a further two years. 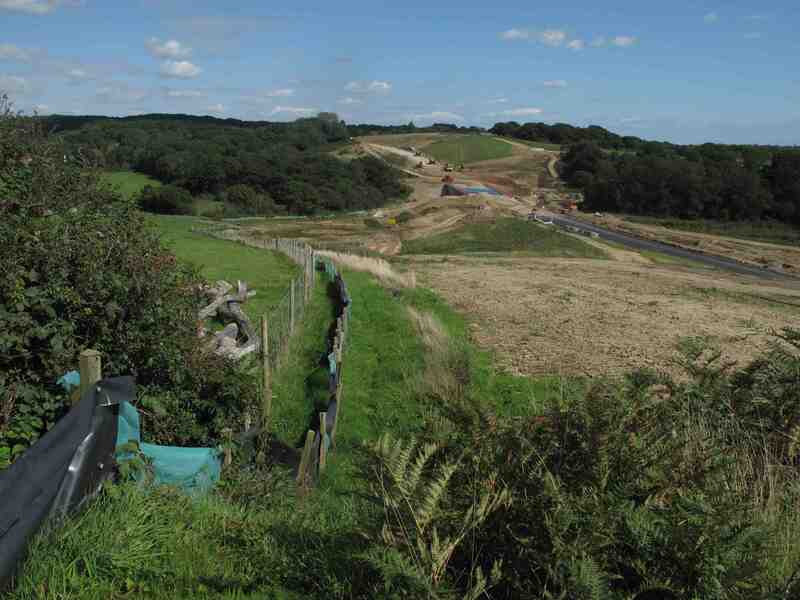 The government’s ranking of the Link Road in the ‘value for money’ league table for all English local authority road schemes was bottom of 23 and the worst for CO2 emissions: the environmental impact of the road was calculated by the Department for Transport as incurring a cost of between £77m and £123m. Nevertheless, our ‘prudent’ austerity conscious chancellor, George Osborne, ignored that, as well as the Department for Transport analysis that the jobs claimed to follow the road were grossly inflated by a factor of 3.5, and awarded East Sussex County Council £56m. Local taxpayers have been and are liable for the continuing cost overruns with the bill now standing at £65m. This post concludes with two images taken on 6th September of the formerly intimate, tranquil Decoy Pond Stream Valley showing the BHLR separating Decoy Pond Site of Special Scientific Interest (SSSI) and Little Bog Wood (left of the road site). 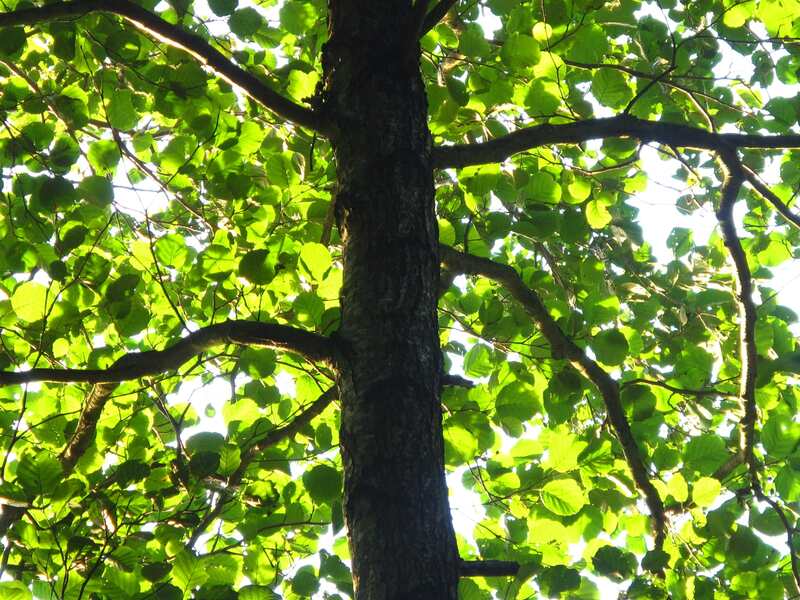 Silent no more, Little Bog wood is classified as ‘Ancient’ and along with Decoy Pond Wood is visible on maps from the 1700s but existed in medieval times. 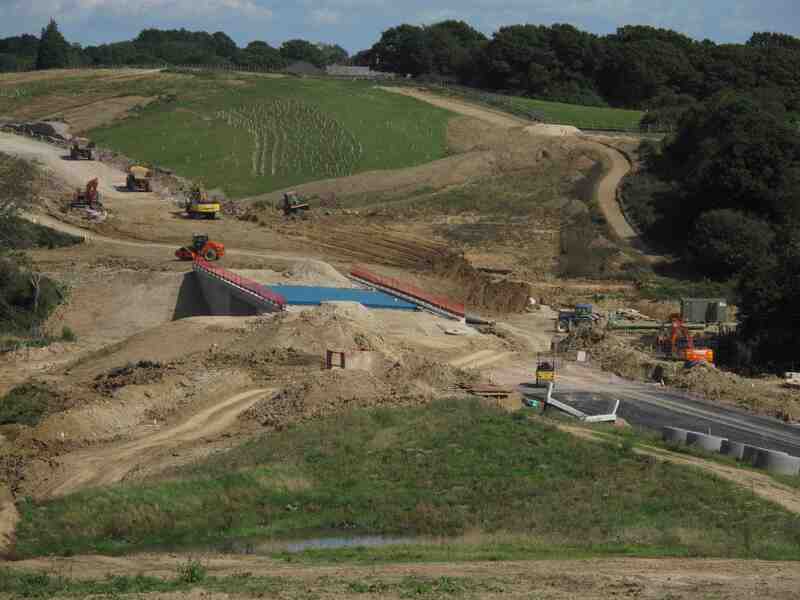 Described by the Department for Transport in 2012 as offering ‘low to poor value for money’, the BHLR was originally intended by East Sussex County Council (ESCC) to open in late 2008. The considerably later May 2015 opening date has now slipped and there is currently no revised date. The eventual cost to local council taxpayers is also unknown but continues to rise. Chancellor Osborne ignores all the experts’ doubts and gives the BHLR the go-ahead in any case, before the DfT analysts had finished their work. Funding was announced in the 2012 Budget Statement. 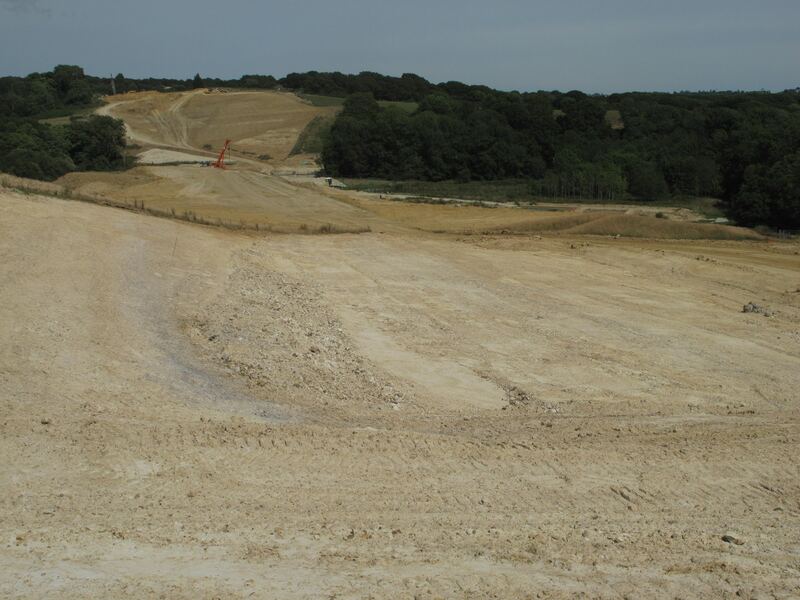 Rising costs and the damage to the ecological, archeological and landscape riches will have further reduced the ‘value for money’ of this expensive vanity scheme. Did Ministers for Transport disagree? When we asked the DfT what recommendations to ministers were ‘on the table’ immediately prior to the 2012 Budget Statement, we were denied that information. We appealed to the government’s independent ‘Information Commissioner’, asking that the recommendations be revealed by the DfT. Almost a year later, the Commissioner upheld our appeal and instructed the DfT to reveal the ‘redacted’ recommendations. (see links below). As we suspected, these included an option to provide £56m of funding towards the BHLR; they also included another option to fund a package of alternative measures that would benefit Bexhill and Hastings: it was this option that was hidden from the public. A credible public transport based alternative was therefore available that would have avoided the risky, damaging, unhealthy and speculative ‘car based’ path determined by Chancellor Osborne, and cheered on by ESCC, Hastings Borough Council, Rother District Council and the local MPs. There was therefore no prior ministerial agreement from the DfT. For citizens who will have to live with (and pay for) all of this, there is still vagueness about the ‘complementary’ transport measures claimed to be planned by the transport authority, ESCC. With 15 years to conceive, plan and deliver bus, rail, pedestrian and cycle networks little has happened: there is no current plan. Whatever concoction of ‘sustainable’ transport we end up with, it will follow some way behind the traffic generating Link Road and simply be ‘bolted on’ to the core car-based strategy given primacy by the promoters. Those depending on, or who would choose and enjoy high quality alternatives if they were available, are not given consideration. The whole package of healthier alternatives that could have been delivered would have cost a fraction of the Link Road and benefits would have been enjoyed by all members of the community. In the medium to long term, pressure on A&E departments would reduce. New ‘state of the art’ buildings on Queensway lie empty despite promises of hundreds of new jobs being attracted. 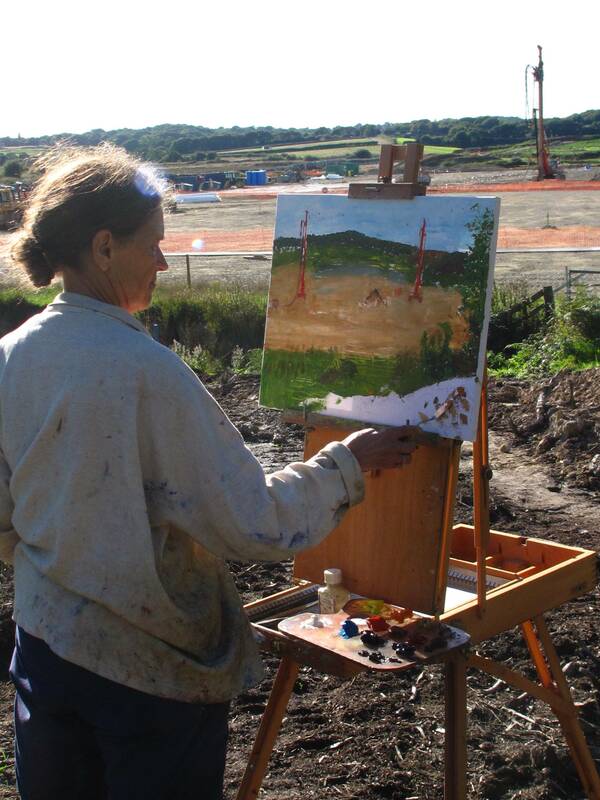 In 2012, Hastings Borough Council hosted an international conference on managing ‘climate change’ in one of the buildings – an edge of town location with no bus links. How was this ever an acceptable venue? What did delegates from other countries make of such an embarrassingly unsuitable choice ? New ‘real time passenger information’ signs are being put in place in Hastings and Bexhill – two cheers for that – but we’ve waited many years for that promise to be fulfilled and in the meantime, services have been cut. If the brand new information display tells a passenger that there are no buses, it will make any claim of availability of a comprehensive and integrated transport service look very hollow indeed. It will also cause upset, annoyance and sadly, for those who have a choice, rejection of the sustainable and healthy option. Even conventional timetables have failed to appear in Hastings on the first day of the new Stagecoach summer services. The cuts referred to above were intended to save ESCC £1.79m. Against the sums being thrown at the Link Road, this looks a tiny amount indeed. The richness of archeological finds in the four valleys* being sacrificed to the road and interests of the motor trade in general, and the destruction of a beautiful succession of tranquil valleys within which the historical assets might have been enjoyed by future generations, is an appalling comment on the values of those promoting the road. Above: Decoy Stream Valley, once peaceful. 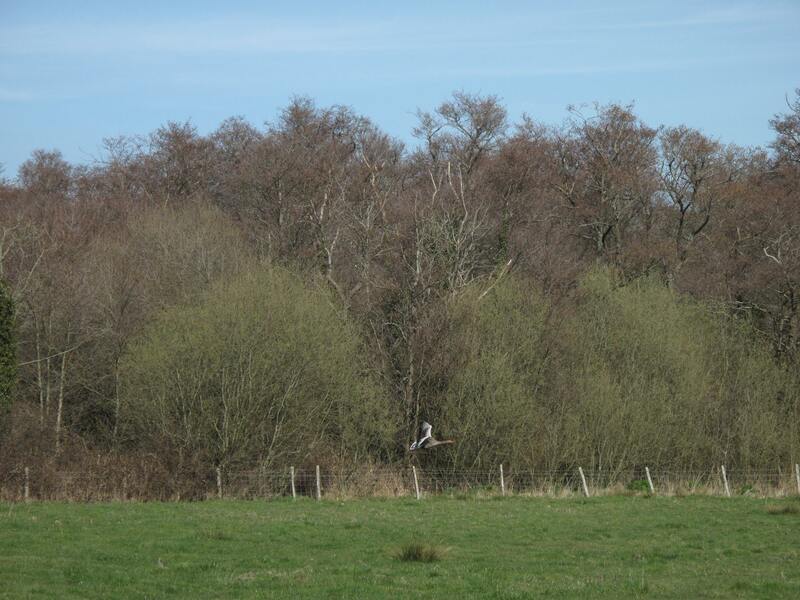 Below: Greylag goose in Decoy Stream Valley, alongside wood in above photo, left. 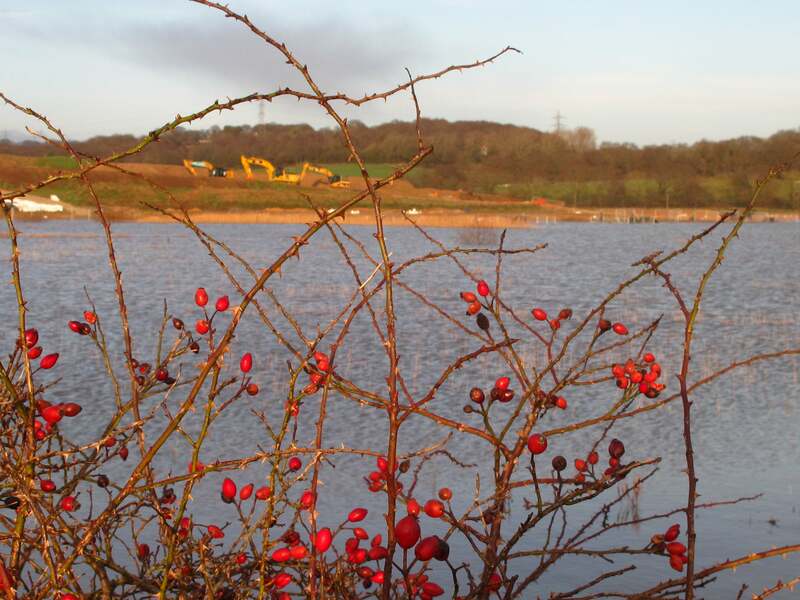 Now standing at £7.6m, the funds ‘borrowed’ from the county council’s contingency fund to pay for the Link Road have been added to the balance sheet. This fund is primarily for emergencies such as the Lewes floods in 2000, when flooded out families had to be rescued and re-housed. The irony is of course that if we had a comprehensive set of alternative measures, with incentives to use them, at least we’d be heading in the right direction in rendering the air quality problem less acute. Building and planning big new road schemes and going slow on walking, cycling, bus and rail improvements is bad for your health! Lewes, November 8th – march to County Hall: strong opposition to the attack on the bus network, following a similar demonstration in Hastings. In Hastings, two services have been maintained with funding from the parking surplus. 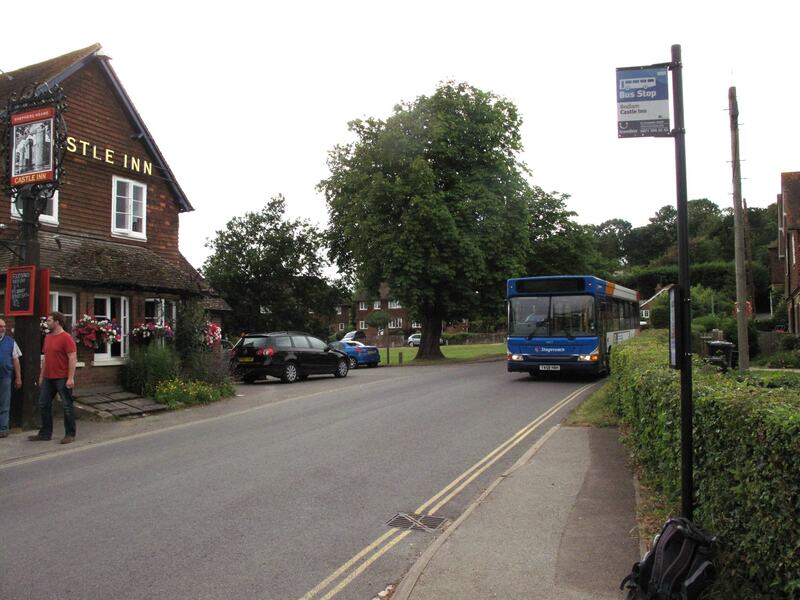 No such thing is possible in Wealden or Rother, where parking is overwhelmingly free and plentiful, thus undermining the bus services which benefit everyone – including tourists and visitors and the associated tourism economy so important to East Sussex. Battle Abbey, Bodiam Castle and Batemans receive around 374,000 visitors a year yet public transport access is poor. 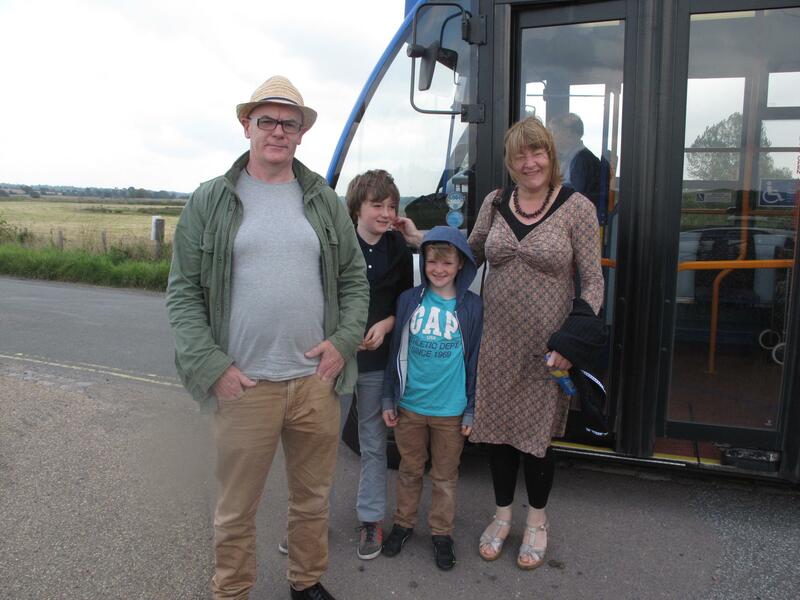 There is a train to Battle (half a mile walk to the Abbey) but the Sunday buses (304) have been withdrawn; there is no Sunday bus to Bodiam (349), even on Sundays during Bank Holiday weekends; there is no Sunday bus serving Batemans and has not been for many years. No service will be provided on the 254/304 and 349 on any Sundays’. There will be confusion and disappointment among tourists and day-trippers who rely on public transport, especially on the Sundays within the Bank Holiday weekends. 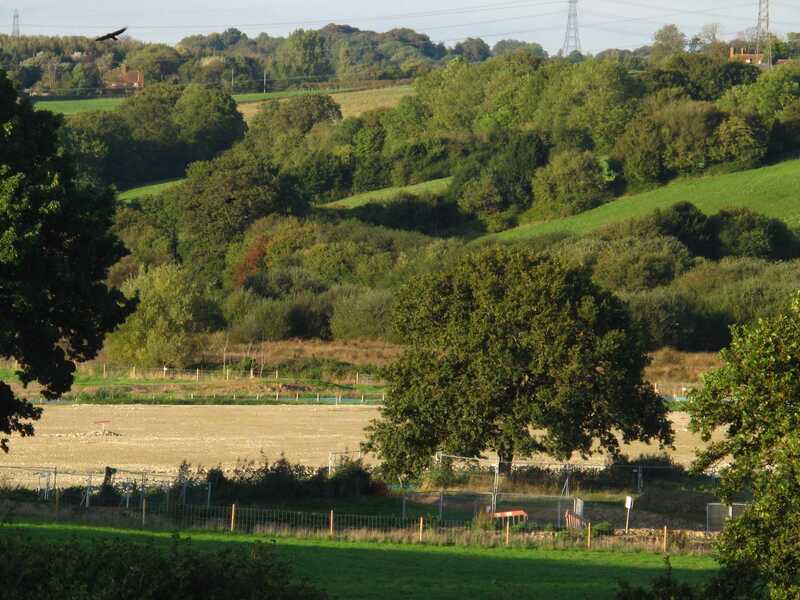 Access to the High Weald Area of Outstanding Natural Beauty (AONB) by public transport will therefore be diminished. It seems the AONB is protected for all members of the public except those without access to a car. The objective to protect the AONB is contradicted by a policy to reduce bus services and increase traffic. Good for car sales! A piece of good news came from Uckfield/Heathfield/Burwash/ Etchingham and Hurst Green where the daily mid-day east west service was saved from reduction to a two days a week service. It will now run 6 days a week (not Sundays). Generally, connections with trains at Etchingham from Heathfield/Burwash are available, but to Tunbridge Wells/Charing Cross much less so. The printed timetable issued ahead of the new service operated by Sussex Bus doesn’t give train connection times. This would be most helpful. Check Traveline for times. Notably, the Hastings Arrows services are left unscathed. 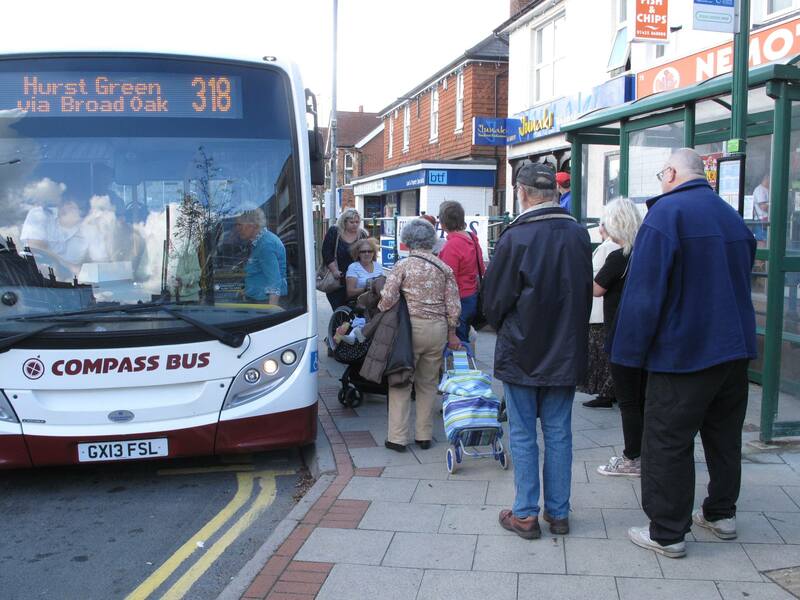 The successful, well used services are the result of the Quality Bus Partnership (QBP) proposed and implemented by East Sussex County Council between Hastings/central St Leonards and Hollington in the early noughties. The other two proposed QBP routes – one serving The Ridge and the other West St Leonards, Bexhill and Little Common – were proposed by the county council in 2000 but never taken forward but surely would have attracted large numbers of passengers and would very likely have played a part in reducing congestion and improving air quality. The reason for their abandonment? Well, quite possibly, the obsession with the Link Road is to blame: the new bus routes (plus Glyne Gap station and a decent cycle route) might have been too successful! These cuts and uncertainties around bus services will discourage any shift away from car dependency and towards the bus. Steady improvement of services and incentives to use them, with a clearly stated intention to carry this out over a number of years into the future , are the only way to allow the bus service to make its full potential contribution to meeting the accessibility needs of individuals and communities, and making a useful contribution to reducing climate change gas emissions. For the benefit of those patients and visitors wishing to access either of the two major hospitals at Eastbourne (DGH) and Hastings (Conquest), and for those who work there, a 99X limited stop service should be introduced. Here’s what we think about the absence of public transport links between the hospitals and the communities that rely on them (link):Hospital Transport Links Presser. Every 10 years or so, the ‘south coast motorway’ idea pops up, with politicians fuming over the length of time it takes people to drive from Folkestone to Devon (it’s always a single journey – they must settle there!). This is usually followed by a study which discovers that no-one actually drives, or wants to drive from Folkestone to Devon and, in fact, any congestion hot-spots are connected with much shorter trips – themselves associated with daily journeys to work, major hospitals or the school run. The last official study (South Coast Multi-Modal Study, 2002) found: ‘little justification for a long distance strategic south coast route’. 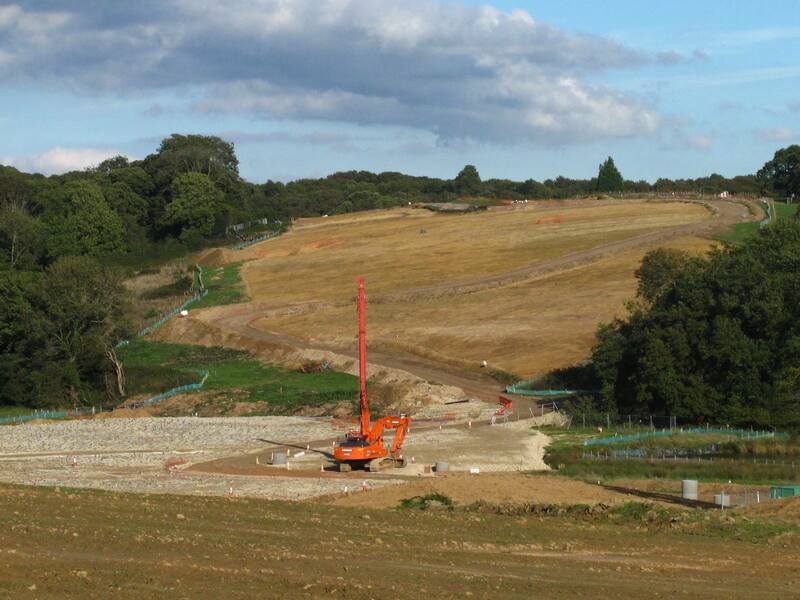 The latest proposal for a study on the A27 came from the Department for Transport as part of its Road Investment Strategy (RIS). It was a hastily conceived proposal (election time drawing close!) which caught the Highways Agency (now Highways England) by surprise. This haste led to very short timeframes, short notice given to stakeholders prior to meetings, and lack of clarity as to who should attend: a bit of a shambles. 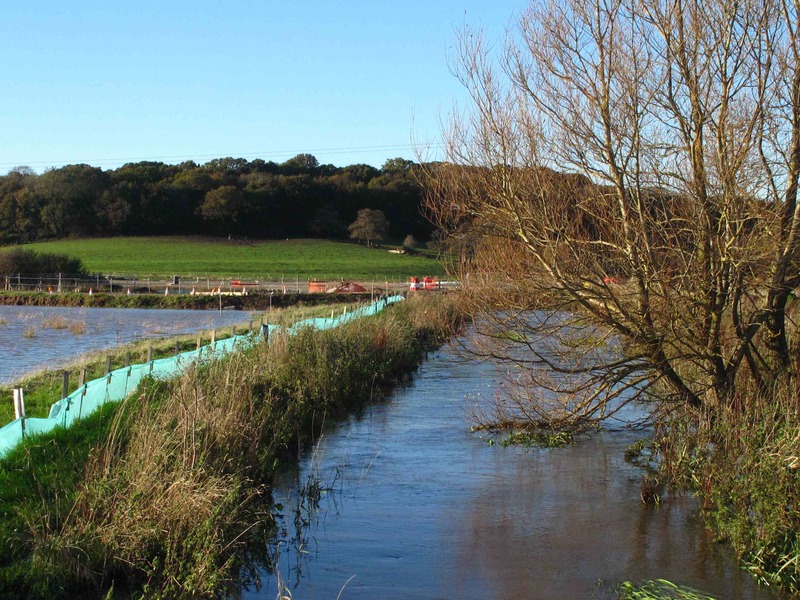 The SCATE website will give you more detail of the proposals for the A27 between Chichester and Pevensey. Its proposals appear to accept a ‘back of a fag packet’ figure for new job creation east of Eastbourne, close to that discredited by the Department for Transport’s analysts. (3,500 as against a DfT figure of 900 – 1,000, many of which would go to workers from outside the area). 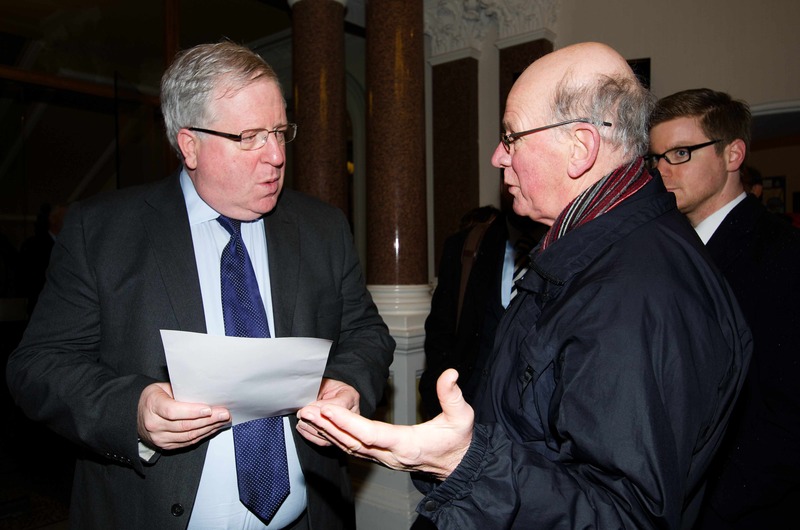 The Secretary of State for Transport, Patrick McLoughlin, was invited to a meeting at Eastbourne Town Hall on 28th January by Eastbourne Chamber of Commerce to meet those clamouring for the major new highway between Eastbourne and Lewes. Derrick Coffee of Campaign for Better Transport, East Sussex was able to present him with counter arguments and to respectfully suggest that to visit Eastbourne to discuss a road scheme – as opposed to transport strategy – was missing the more important issues of first tackling congestion and air quality and securing a good quality of alternative and sustainable modes of transport in the immediate travel to work area. The railway line parallel to the A27 had seen new signalling installed, and could now accommodate more trains – let’s have them please. Sec of State response suggested that buses need better roads: I pointed out that the big boon to car commuting resulting from a multi-million road scheme (A22 new route/Polegate by-pass of 2002) had still not been accompanied by a step change in bus services 13 years later, thus firmly entrenching the car habit. Another boost for car sales! Secretary of State for Transport accepts a press release from Campaign for Better Transport – East Sussex. The pressure of traffic on urban environments and its negative impact is widely accepted. 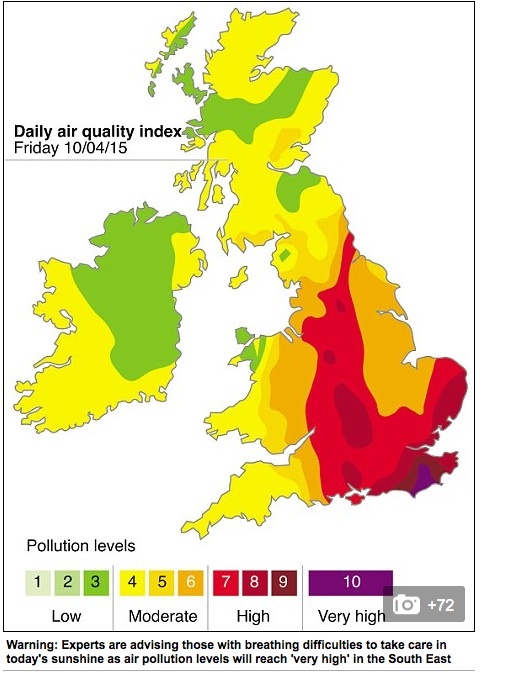 Poor air quality (see above) has long and short term health impacts; pedestrian and cycling conditions are often unpleasant (including for those who drive into town); childrens’ independence and opportunities for play are curtailed or stopped; hazards for children walking or cycling to school induce parents to drive their children, making the trip for those who continue to walk more dangerous; otherwise pleasant, attractive and historic town spaces become heavily trafficked; public transport is held up; and pressure on green spaces increases – reducing opportunities to transform our towns through public art and planting schemes, and to offer tranquil refuges to our residents and visitors. Reducing traffic where possible is a key to addressing some of the above problems. Since 1994, walking and cycling have received much attention as further ways to reduce traffic but local authorities and twitchy politicians, scared stiff of the reaction of car drivers and vociferous business spokespeople, have failed to tackle the issue of parking and its role in degrading everyone’s quality of life and town centre economies. And an excellent public transport offer, 7 days a week, has worked well in Brighton and Hove, with services operating at good frequencies until at last 10,p.pm – and that includes links to/from every residential area and the main hospital. One other notable exception has been the city of Nottingham where a path has been successfully pursued against all the odds to challenge the ‘free parking everywhere for ever’ lobby, very strong in Eastbourne, Hastings and adjacent rural areas of Wealden and Rother. Nottingham’s answer lies in the principle that the city’s public transport system would be better with an investment stream derived from car parking spaces. This is in the form of a levy on each space where each firm with 11 or more parking spaces pays a levy of £362 per space: all the income for this is ring-fenced for public transport improvements and has enabled an extension to the city’s tram network and underpinned its future usage. By contrast, owners of off street private non-residential parking in Eastbourne and Hastings pay nothing towards offsetting the congestion impact of their ‘free parking’; public transport provision remains patchy, especially in the evenings and on Sundays. It is less than adequate. Despite strong opposition at first from Boots – who threatened to move their 3,000 parking places outside the city – no firm in Nottingham has failed to comply with the levy and the number of firms moving into Nottingham has been greater since the levy than in the 5 years before it began. Boots did not carry out their threat. In its three years of operation, and with other initiatives in the city designed to expand walking and cycling provision , the ‘workplace parking levy’ (wpl) has also enabled Nottingham to adequately fund its ‘supported’ bus services. It should not be written off as a joint option for Eastbourne and Hastings, and could provide a funding source to new railway stations at Stone Cross, Eastbourne, and Glyne Gap (Ravenside), Bexhill. If it is serious about tackling congestion and the effects of climate change gas emissions and air quality improvement, East Sussex County Council should have a look at it. In the case of Eastbourne, wpl could also underpin the success and ‘value for money’ of the Hailsham – Polegate – Eastbourne ‘Sustainable Transport Corridor’ scheme which is rumoured to be heading our way. There has been a massive response to the County County consultation on its proposed cuts, though there’s a high probability that the complex design of the questionnaire will have deterred many from attempting to fill one in. Even so, those who have made their objections clear number thousands rather than hundreds – with a petition of 7,000 signatures from Hastings and St Leonards among the responses. With an election round the corner, sitting MP for Hastings Amber Rudd and the Labour prospective candidate have both been drumming up support for the campaign to roll back the cuts as they affect Hastings, as well as their own electoral chances. And both favour the BHLR with its capacity to persuade people to drive rather than take a sustainable bus, thus undermining public transport in general. Shame about that. To date, some Hastings services have been reprieved through Stagecoach ‘adopting’ them as ‘commercial services’ – but there’s the prospect of serious hardship ahead for those dependent upon services still under threat. Sundays, Bank Holidays and evenings would still see poor levels of service – even if nothing changed at all. 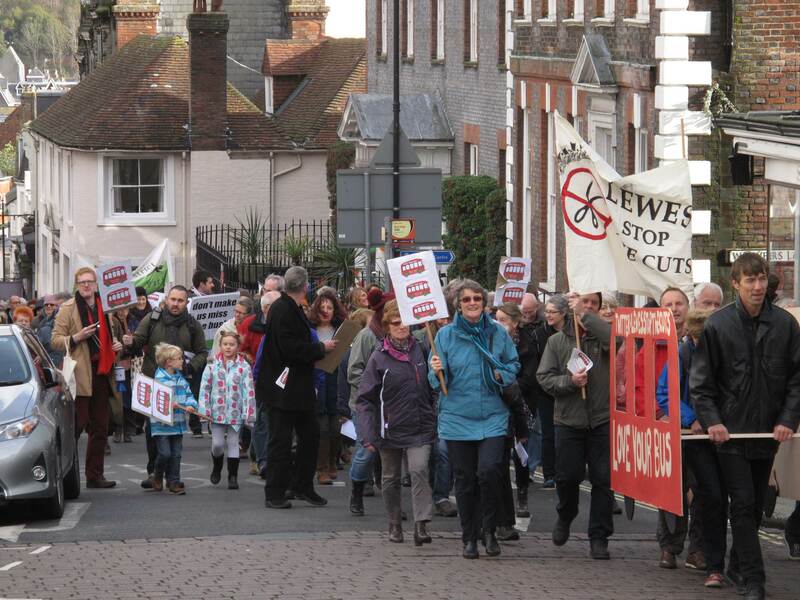 Meanwhile, in Lewes, opposition has also been vocal with the ‘Love Your Bus’ campaign packing public meetings and providing information about the nature of cuts in Lewes – Newhaven – Seaford district. 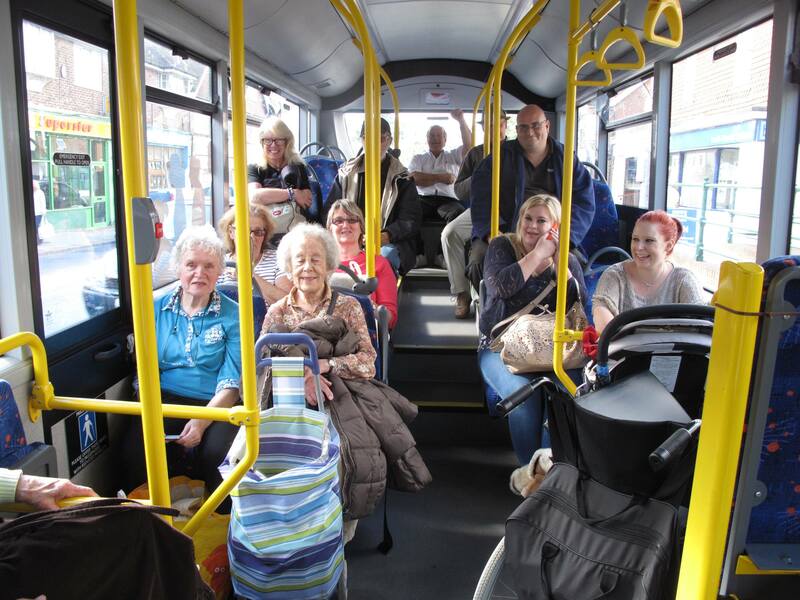 The crowd on the 12.07 318 from Heathfield to Hurst Green on Friday 3rd October look pleased to be on board their bus. What will they do when this service is cut back? 318 – Bound for Broad Oak, Burwash Common, Burwash Weald, Burwash, Etchingham station, Hurst Green…all ages (baby hidden from view). 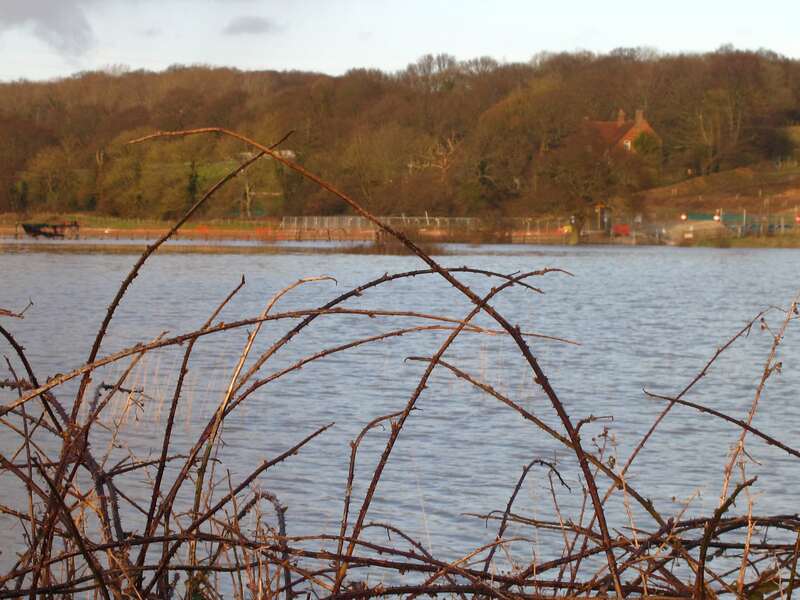 318 – Linking Heathfield and High Weald villages – a future weakened link? Sunday Trip By 349 to Bodiam Castle and the KESR Heritage Railway. Impossible next year? The Edinburgh family on holiday. It is clear that if carried out, the cuts would hurt significant numbers of people who rely on the bus, and remove the opportunity to promote the bus as a useful and attractive alternative to the car: that’s if the County Council takes the trouble to advertise the bus services we all pay for: at present, there is little if any promotion. BUSES TO HOSPITALS – WHEN? POST BHLR ALTERNATIVES – SOMETIME, MAYBE. ‘The changes to clinical services between Eastbourne and Hastings hospitals, with the transport access issues which may result, does raise concerns. This really is a matter for the East Sussex Hospitals NHS Trust to address’. We would point out that ESCC also now has a responsibility for public health. In any event there is an urgent need for a dialogue and there appears to have been none. The matter of choices of alternatives to the car available from day one of BHLR opening, and the need for an exhibition to explain these to the public, was also raised. Well, with bus cuts threatened, Glyne Gap station plans removed by Rother District and ESCC from policy, and a general vagueness about what alternatives will exist in May 2015 (ESCC’s opening date for BHLR), we received confirmation that there is no exhibition planned because alternative transport measures are ‘still in development’. Sustainability is certainly not at the core of ESCC transport policy. Cars first. Alternatives? Sometime, maybe – but why are they incessantly, relentlessly, ignored, delayed or suppressed? They will NOT be there as the Link Road opens. The report also reviewed the earlier report upon which Rother District Council, with tacit support from ESCC, based its decision to remove the station from its development plans. 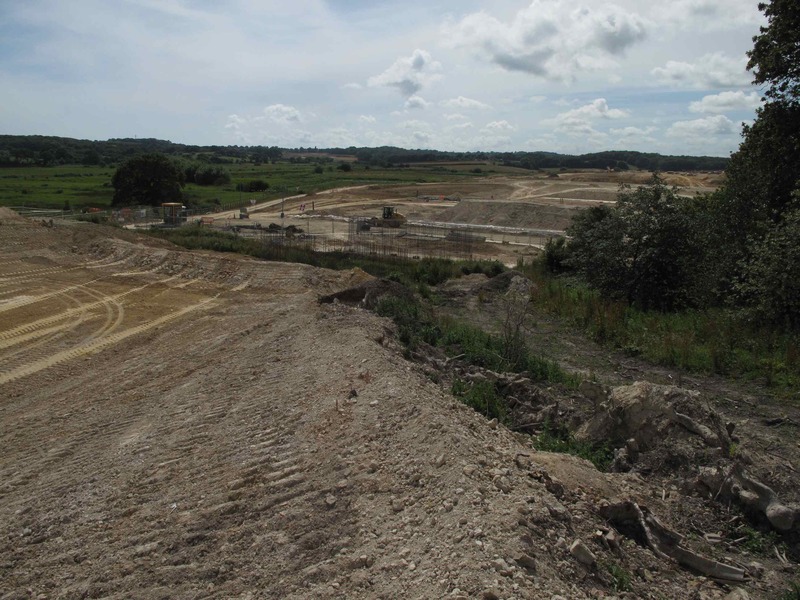 In late July, we received notification from the Planning Inspectorate that in their view, Rother District Council was justified in removing a new Glyne Gap station from the Core Strategic Plan because put simply, there was no chance of funds being made available within the plan period. 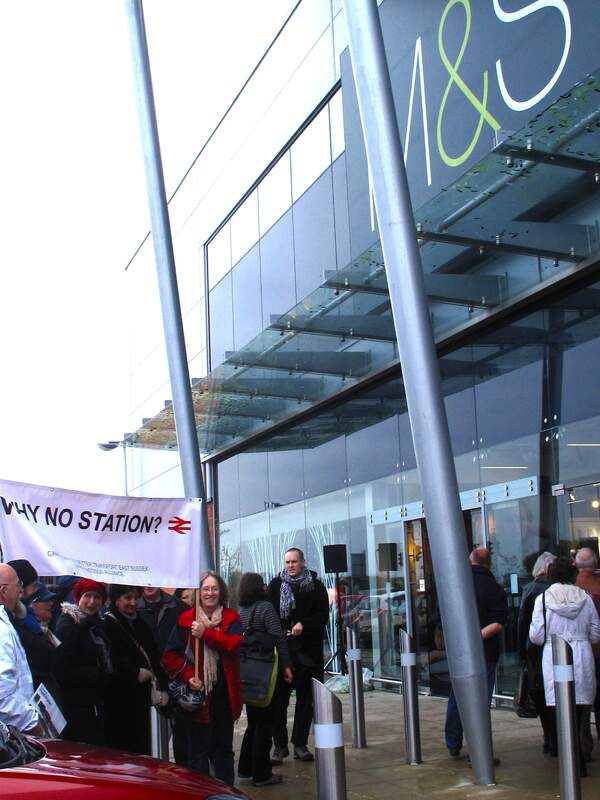 We were extremely disappointed in this because the decision demonstrated a failure on the part of two local authorities to build a case for the station, and also because the case for its removal presented by Rother District Council – with backing from the transport authority, ESCC – was seriously flawed. We shall take the opportunity to re-present our case at some time in the near future. Incredibly, the local authority’s case completely ignored the £multi-million new signalling system, installed and about to go ‘live’. Rother’s and ESCC’s case had predicted just one train per hour because the old signalling system could not permit more trains than this to call at a new station. The new system could have accommodated two trains per hour, helping local people to access their daily needs without the need for a vehicle. It seems as if the £30,000 study commissioned by Rother DC and ESCC was not examined and interrogated by those responsible for its commissioning. The shorter rail trips originating and ending at smaller stations on the Coastway are just as important as the longer distance commuter trips much talked about recently by Amber Rudd, MP. We are convinced, and our commissioned study shows, that Glyne Gap station would be a success – not least in the function of removing short car commute trips (the cause of congestion and poor air quality) from the roads at a cost of under £10m. The £113+ Link Road will simply help to fill the roads up by promoting just such carbon emitting car trips while undermining public transport, walking and cycling and getting in the way of tradesmen and women who need a vehicle to carry out their work. In other local authority areas, the financial case would have been made and the trains would already be calling at the new station. ‘Excellence’ in terms of high quality alternatives to the car are a long time coming: threatened bus cuts suggest that a decline in public transport for Bexhill and Hastings is acceptable to politicians at all levels. Pressure mounts for those who can afford it to switch to the car. Those who can’t don’t seem to matter. 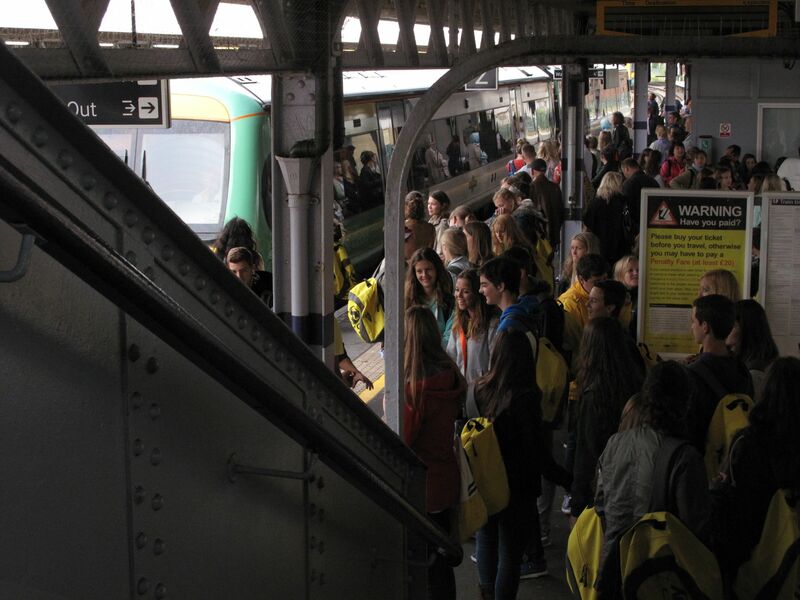 *Unlike Bexhill College students and local shoppers at Glyne Gap, students at Sussex Coast College campus at Ore College and local residents are flocking to use the trains. There’s a station! In one year, following the full opening of Ore Campus, trip numbers to/from Ore station rose by 97,442. There are 2/3 trains per hour. The opening of M&S store at Glyne Gap/Ravenside would have been the moment to open the new station. Bexhill to Hastings Link Road (BHLR) ‘Complementary Measures’ – Offsetting Environmental Destruction – Real Time Bus Information – Access to Hospital, or not – Glyne Gap Station – Bus Service Cuts – Challenging £multi-million South Coast Road Building:Launch of SCATE (South Coast Alliance for Transport and the Environment). 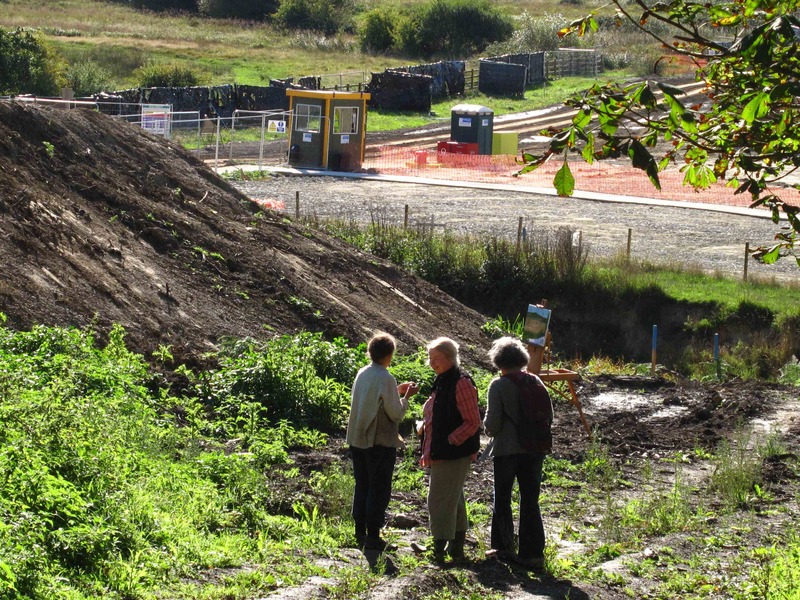 Car users can happily rehearse how they will make use of the Link Road from day one of opening in May 2015 (current ESCC prediction) – maybe doing new journeys, or switching back to their cars from sustainable, healthy alternatives. Those without access to a car, are unable to drive, or who choose not to, can only guess at the promised improvements to alternatives to the car. These were always described by East Sussex County Council (ESCC) as ‘complementary’ to the Link Road. Remember, alternatives were never fully examined: there was a resolute refusal to do so. But what? When? Where? In our view there should be advance publicity around this issue, and a prospect of delivery of ‘high quality’ healthy and sustainable transport coinciding with opening of the Link Road rather than a confused picture of what to expect, and a ‘managed decline’ in bus services now offered through impending cuts. It is grossly unfair that after 14 years of planning the road, there is almost complete silence on the nature of those ‘complementary measures’ we were led to expect, and what exactly non-car users can look forward to as the Link Road opens. 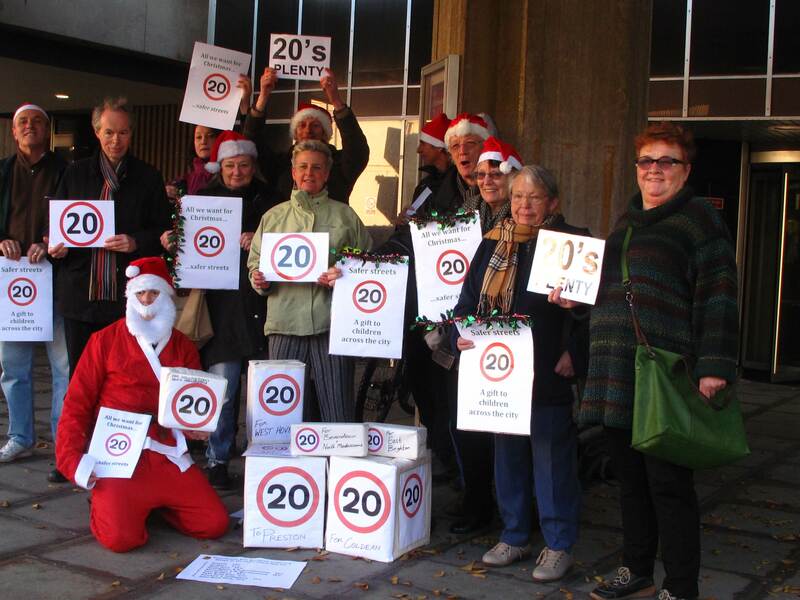 This group of the electorate – plus young people – clearly matter less than habitual car drivers. Time for an urgent dialogue between ESCC and Stagecoach – it might be fruitful. We have formally asked ESCC to hold exhibitions showing what will be in place on day one of Link Road opening for non-car users. We have heard nothing. 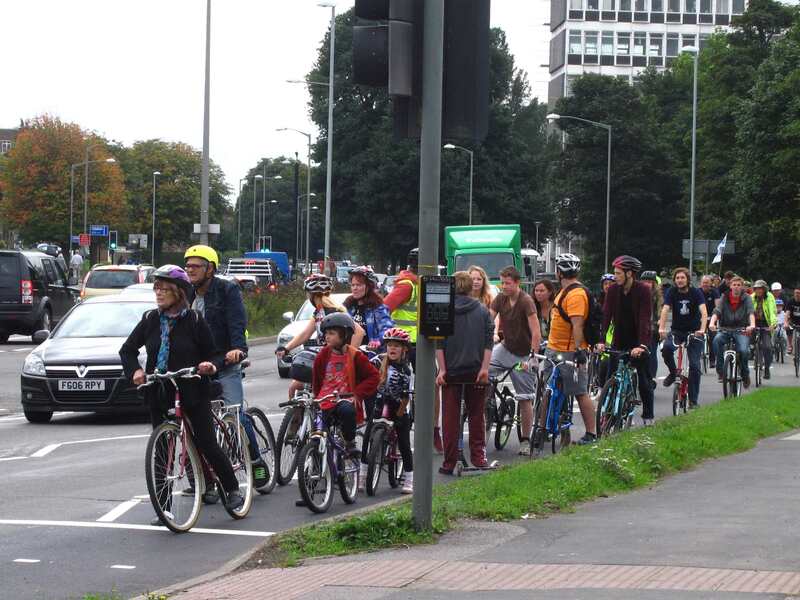 A failure to set in place high quality alternatives to the car at that point in time will simply promote the ‘car habit’ and increase traffic congestion, making it much harder to promote or achieve a high take-up of ‘active travel’ – walking, cycling and public transport. This has serious implications for public health and doesn’t comply with ESCC policy, or health policies in general. Once again, it seems that alternatives will lag behind provision for the car, struggling to play catch-up. Sure does – but what and where are the plans? The bus service to The Conquest from Bexhill may, or may not run on the Link Road. The last we heard, it would run to Tescos where passengers would need to change for the Conquest. Good for the supermarket, but not for those wishing to get to and from the hospital. Evenings, Sundays and Bank Holidays would be excluded. The proposed frequency is unknown. The wider issue around access from communities to their local hospital, or newly reallocated clinical services, is also unresolved, with Eastbourne District General Hospital (DGH) better connected to its local communities than is Hastings, but no improvement in sight for public transport access to either hospital from their more distant ‘catchments’ eg Hastings Conquest from Hailsham/Eastbourne, or DGH from Bexhill/Hastings. How needs of patients, visitors and staff will be met is unknown. There has been no forward planning, over recent years, simply never ending car park extensions which generate more traffic and undermine the bus market and make walking and cycling unpleasant. It’s crazy! Those with access to a car are fine. But a taxi from one to the other costs £34. There is not a comprehensive bus service – and there are no signs of one appearing. The Royal Sussex in Brighton offers a good practice example for bus access until late evening, should anyone be interested – and they should be. Funding for Real Time Passenger Information signs (RTPI) intended for Hastings and Bexhill – indicating how long until the next bus arrives – was a casualty of funding the Link Road. 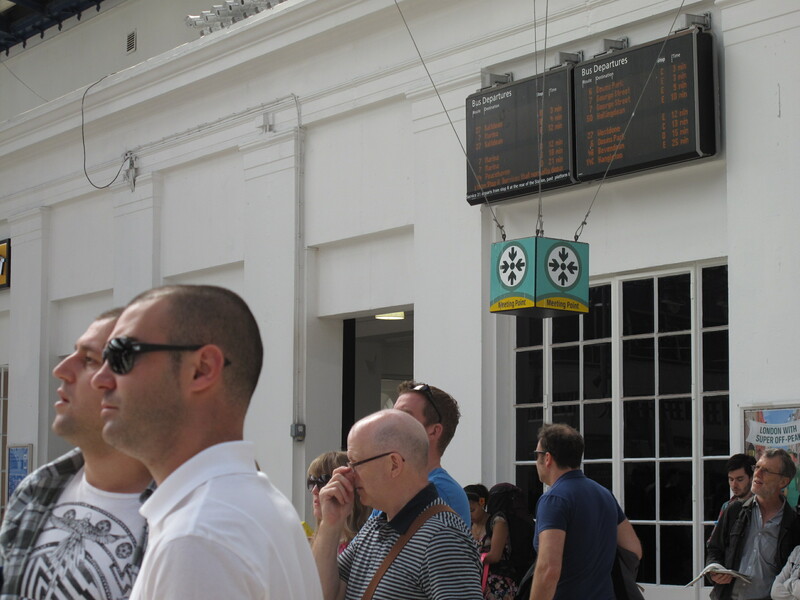 These signs have long been in operation in Brighton, including inside the station where people can clearly see what buses are due at stops outside the station. Government funding for these was withheld because ESCC had received millions of pounds for the Link Road. ESCC are going to provide the signs eventually but there is confusion over how many, and where they’ll be. We heard recently that they would not be provided at Hastings Station/Bus Interchange. Clearly, at that location they would be welcome. Inside hospital foyers and the FE colleges in Bexhill and Hastings, and the university would be other obvious locations. Then ideally there would be displays at bus stops over the wider area, including Battle and Rye (and Heathfield and Hailsham). At present, there is no information about information. Public transport works better with clear and prominent information displays but the installation of the displays mentioned has got off to a disastrous start in East Sussex coastal towns. This, plus open talk of cuts to come, does nothing for public confidence in the bus service, and relegates the status of the bus. It’s a subliminal advert for the car. 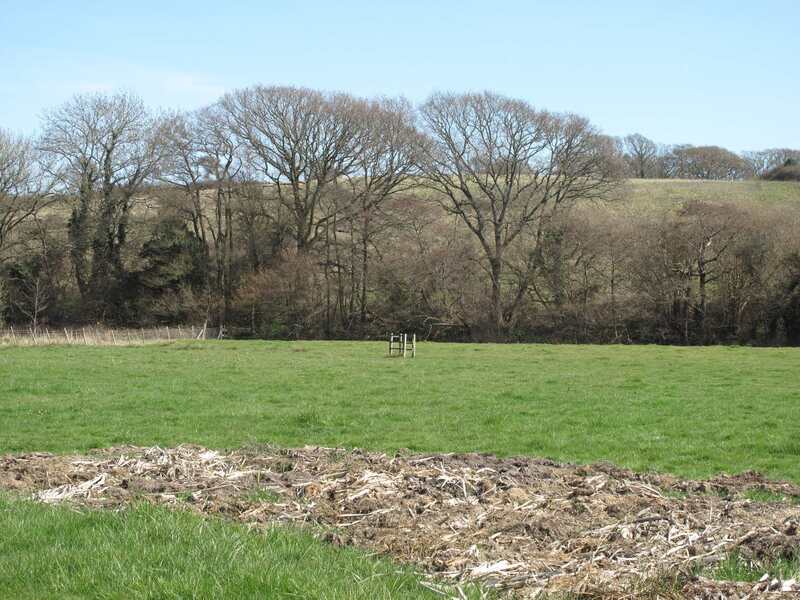 We wait, and wait, for a decision from the Planning Inspectorate on the controversial proposal from Rother District and East Sussex County Council to remove a plan for new station at Glyne Gap (Ravenside) from Rother District Plan and the County’s Local Transport Plan 3. We objected to the local authorities’ proposal and campaigned hard for its retention and funded a study which showed that the proposals to ‘delete’ the station plan and the £30,000 report on which it was based were flawed. The station would serve the large traffic generating retail park at Ravenside on the A259, the FE college nearby and local residents. We need a new station. We need more trains! 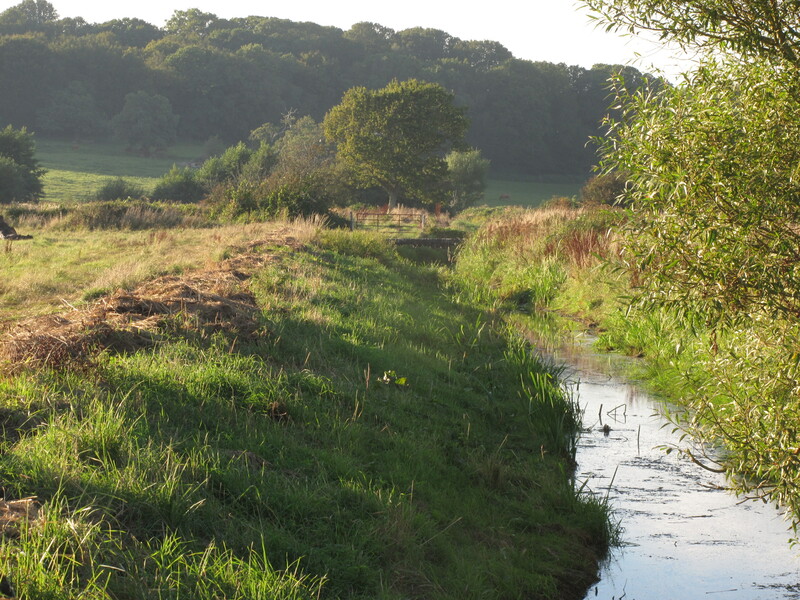 One condition placed on funding approval for ESCC’s Link Road was a requirement to enhance a habitat in the ‘Brede Hastings area’ to offset loss of habitat in Combe Haven. The work will cost £250,000. 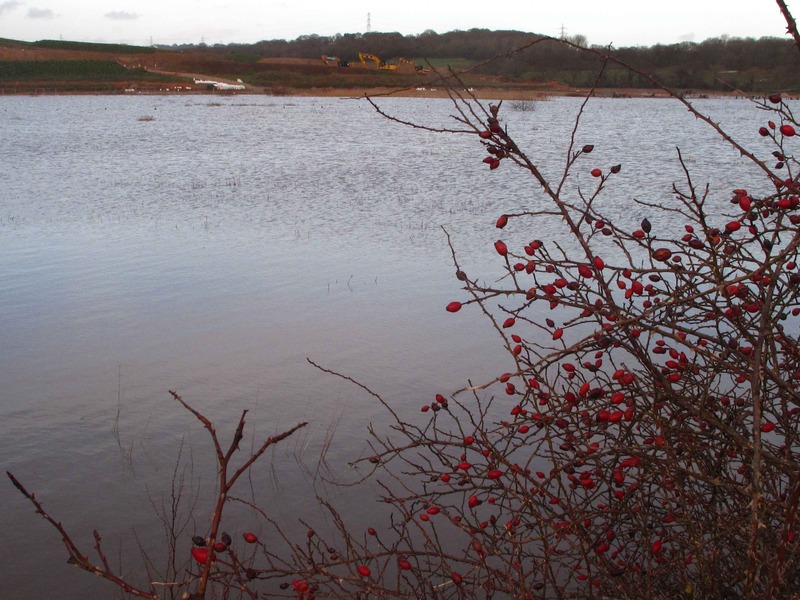 The habitat is ‘wet woodland and grassland’. 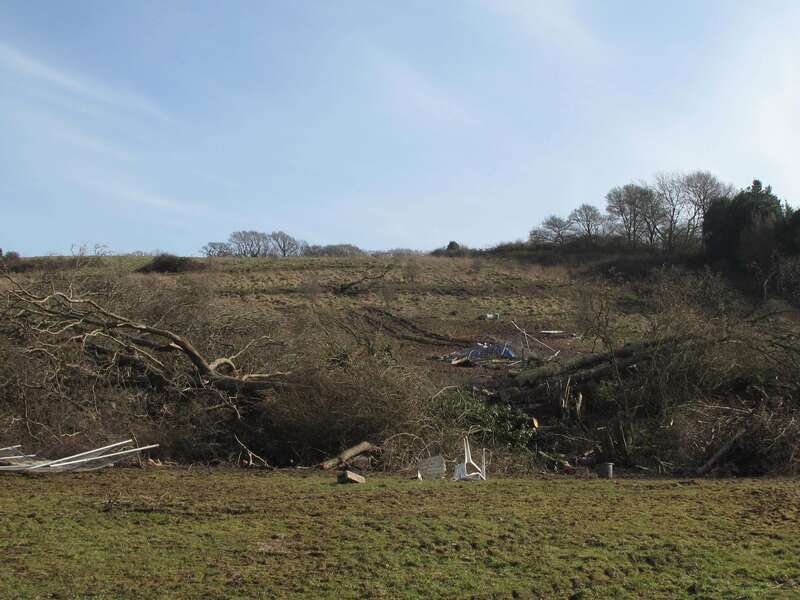 It may well be a pathetic attempt to make up for the wreckage in Decoy Stream valley – completely ruined now – and set to be further degraded when the traffic roars through what was a beautiful, tranquil, intimate, steep sided valley. If an intention is that those who rue its loss may experience something in the area of Brede/Hastings to make up for it – which is very doubtful and more likely impossible – then accessibility is an issue. It should be equally accessible to the ‘sacrificed site’, and accessible to all. Where is it? How may people get there? 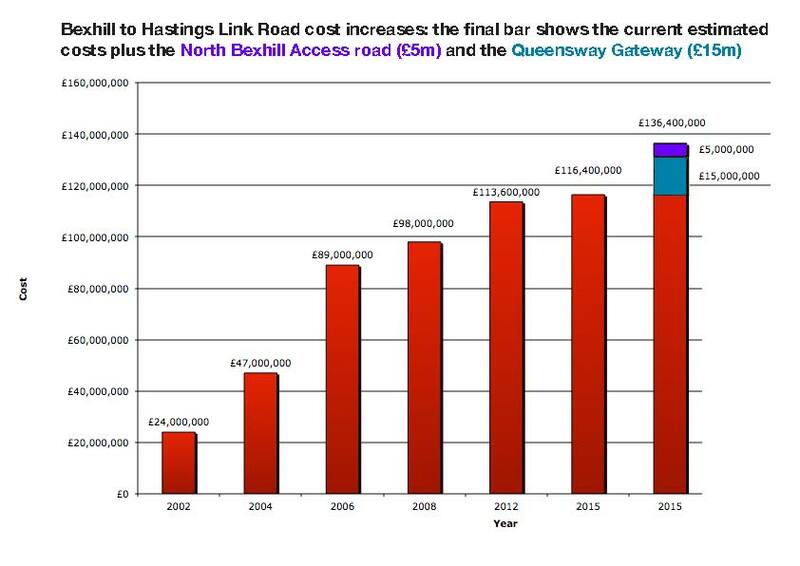 It won’t be easily walkable from Bexhill/Hastings and if there is a bus there’ll be a cost. Even if there’s a bus now, current plans to cut services may remove the service. (See below). ESCC won’t give us a grid reference or accessibility information (requested twice). Worryingly, according to Secretary of State for the Environment, Owen Paterson, MP, offsetting is acceptable if the offset site is ‘up to an hour’s car drive away’. That’s both dismissive and ignorant. PROPOSED CUTS TO SUPPORTED BUS SERVICES. Hastings – including links to the Conquest Hospital – is particularly badly hit by the cuts on weekdays, and on Sundays, for those wishing to access some of the best walking country in the south-east, there may be no buses at all. 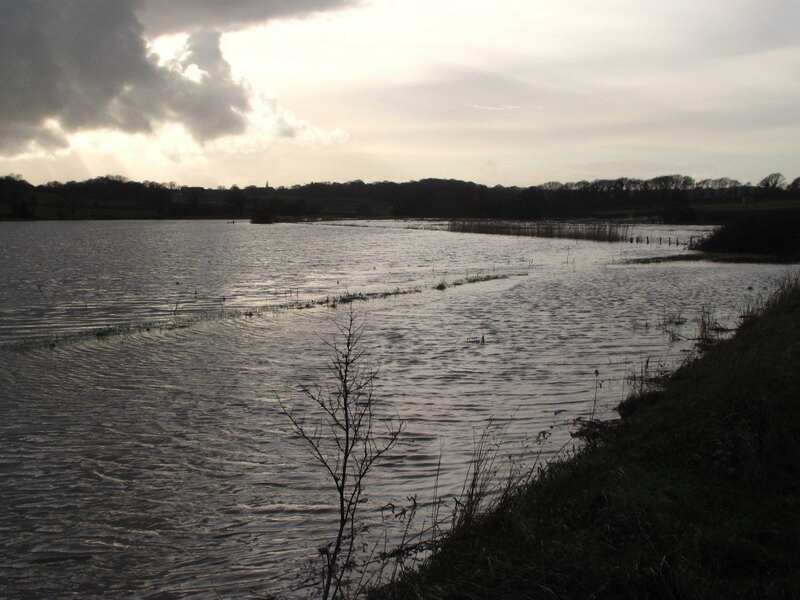 The ‘honeypot’ of Bodiam Castle will be inaccessible by public transport, along with the adjacent heritage railway. 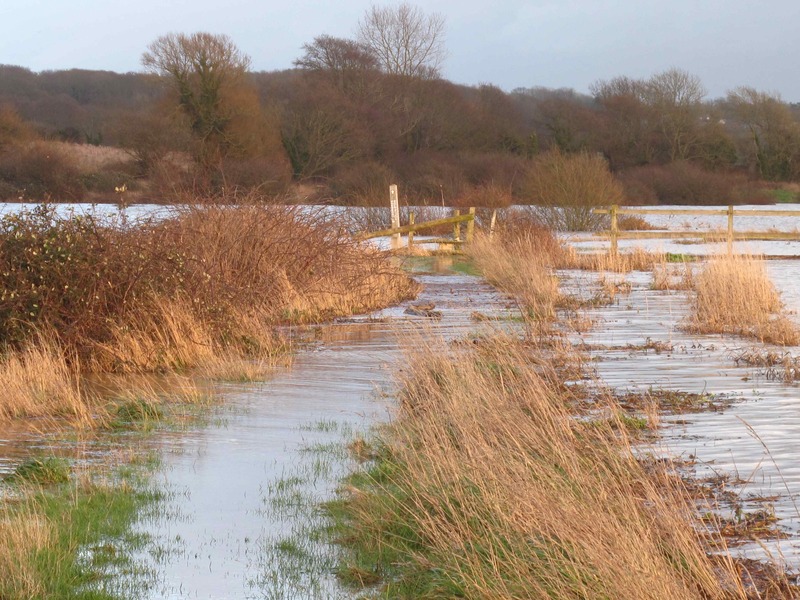 BELOW: HASTINGS – BODIAM – HAWKHURST SUNDAY SERVICES MAY BE SCRAPPED. Currently there are four buses each way on Sundays and Bank Holidays. 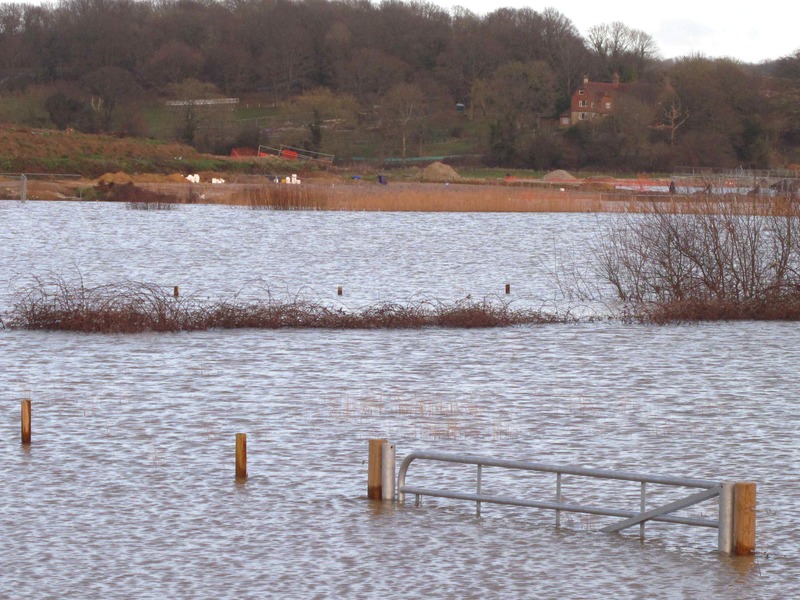 Hastings Country Park, Fairlight, Winchelsea Beach, Rye and Northiam could lose their Sunday buses too. We note that the National Trust is Committed to reducing the impact of traffic on its properties and the countryside in general, and maximising access by public transport, walking and cycling. The cuts won’t help. If you wish to make comments on the proposed cuts directly to CBT East Sussex, feel free to do so by e-mail to: derrick.coffee@talk21.com I will incorporate comments in a response. If you have time to submit a response that would be great. The funds for the ‘low to medium value for money’ (according to the Department for Transport) Link Road and associated schemes will run to £150m or more, while the East Sussex bus support grant of £1.7m is apparently unaffordable. But ESCC is chasing many more millions of public funds to spend on grand road schemes along the coast without – as with the Link Road – considering sustainable, healthy alternatives that do not spawn sprawling and unhealthy car based developments. Health professionals warn us now of the impending crisis that will accompany obesity and consequent Type 2 diabetes caused by poor diets and sedentary lifestyles. A serious and urgent investment in alternative, healthy transport would help to avoid the worst of this: the last thing we need is more road building, its accompanying car dependency and its wasting of land. The costs imposed on the NHS through a failure to meet and beat the obesity challenge would, they warn, threaten the survival of the NHS. A great example of popular cycle infrastructure investment is the Lewes Road cycleway, Brighton, opened late last year. Measures to support cycling such as this typically repay every pound of investment with up to £20 – in some cases the figure is even higher – of benefits in health improvement, better air quality, reduced CO2 and pollution, less noise and less parking space required. Accompanied by 20mph zones to encourage cycling in all residential areas, such schemes promote strong growth in walking and cycling. Kings Drive, Eastbourne and St Helens Road, Hastings might be given the same treatment, while a route parallel to the railway line to Ore might also be successful. It is clear that a strong commitment and major shift to investment in sustainable transport, rather than a car-based future with its accompanying health disbenefits and environmental degradation, both rural and urban, is a way forward to improve public health – physical and mental. South Coast Alliance on Transport and the Environment . 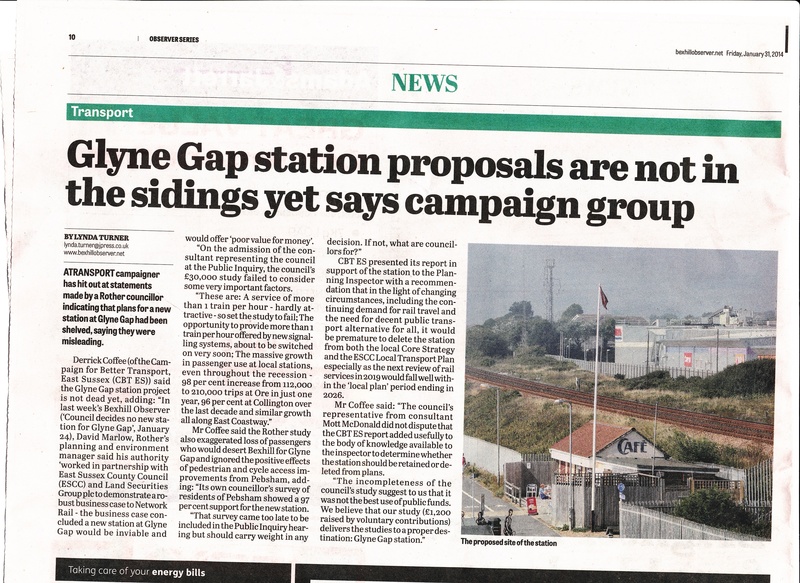 GLYNE GAP STATION PLANS ”Should be retained for the next planning period” – JRC Consultancy report January, 2014. Concurrent with the demonstration in support of a new station at Glyne Gap, and following a formal objection to deletion of the station plan from Rother’s planning policies and East Sussex County Council’s Local Transport Plan 3, (See previous post on this website), Campaign for Better Transport – East Sussex (CBT E SX) commissioned JRC consultancy to review the councils’ own £30,000. report. That report – carried out by Mott McDonald – evidently had flaws and omissions: importantly, it ignored the new signalling system about to be ‘switched on’, and failed to investigate the potential difference that this could make to provision of new services. The JRC report – presented by CBT E Sx at the Public Inquiry into the council’s proposed amendments to next local plan for the period to 2026 – Glyne Gap station review JRC 644 Final is critical of the council’s commissioned report, pointing out its shortcomings (as well as some useful research). For instance, the ‘one train per hour‘ service would set the business case to fail and yet the new signalling could potentially accommodate two trains per hour, giving a much better ‘benefit to cost’ ratio. That was never tested. 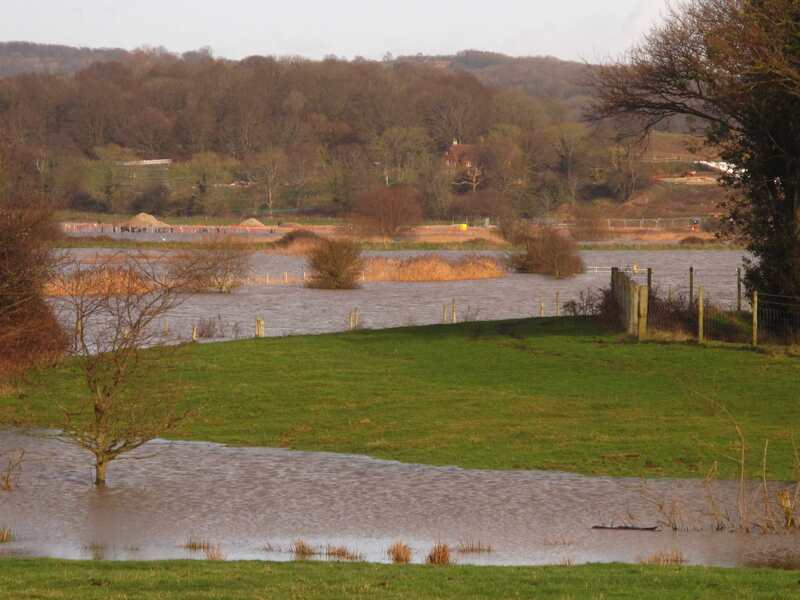 Rother District’s consultant admitted that he was never asked to look at that scenario! It wasn’t in the remit given him by the two councils. The extent to which passengers would be ‘lost’ to Bexhill through using Glyne Gap was exaggerated and took no account of passengers new to the railway; the massive growth in popularity of rail travel was underplayed ( a doubling of passengers at Ore from 112,000 to 210,000 in just one year and 10% for each of the last ten years at Bexhill and Collington! ); the value of an extra train per hour serving local stations was overlooked; improved pedestrian/cycle links to Pebsham community, a better complementary bus service and area wide and well marketed ticketing including bus and rail travel as in other urban areas – none of this was considered of interest or benefit to residents or visitors. On top of this, the decision to delete the new station plan didn’t fit with national or local policy – including support for local economies, health and environment – and was considered premature and unnecessary since the railway timetable would be re-examined for 2019: that’s 7 years before the expiry of the Local Plan period in 2026. Overall, CBT E Sx considers this to be a poor decision flowing from an incomplete study, and outside of any overall strategy ignoring the hopes, needs and changing lifestyles of the younger generation. Glyne Gap 3,000 Words Sub. Any temporarary relief afforded the A259 by BHLR may be very short lived. Unless there are high quality alternatives to the car and parking controls to lock in the benefits, the traffic will simply grow back. The Bexhill Observer headlines of 31st Jan 2014 celebrated the planned bus lanes for the A259 as bringing a ‘cut in A259 gridlock’: there was an editorial sigh of relief: ‘At last…..’. But the ‘gridlock’ scenario rarely applies to Bexhill Road and the traffic is almost always moving, if slowly: that’s good, not bad for residents, pedestrians and cyclists. A recent trip on the 99 from Hastings to Eastbourne included a total of 18 minutes where the bus just sat at stops between Hastings and Bexhill. In any case the situation is always much worse in school term time. 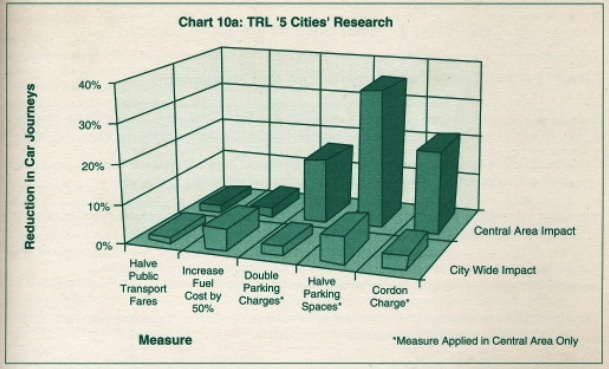 And the bus lanes, along with many other sustainable measures promoted by CBT E Sx for many years, could have been implemented in the early 2000s. 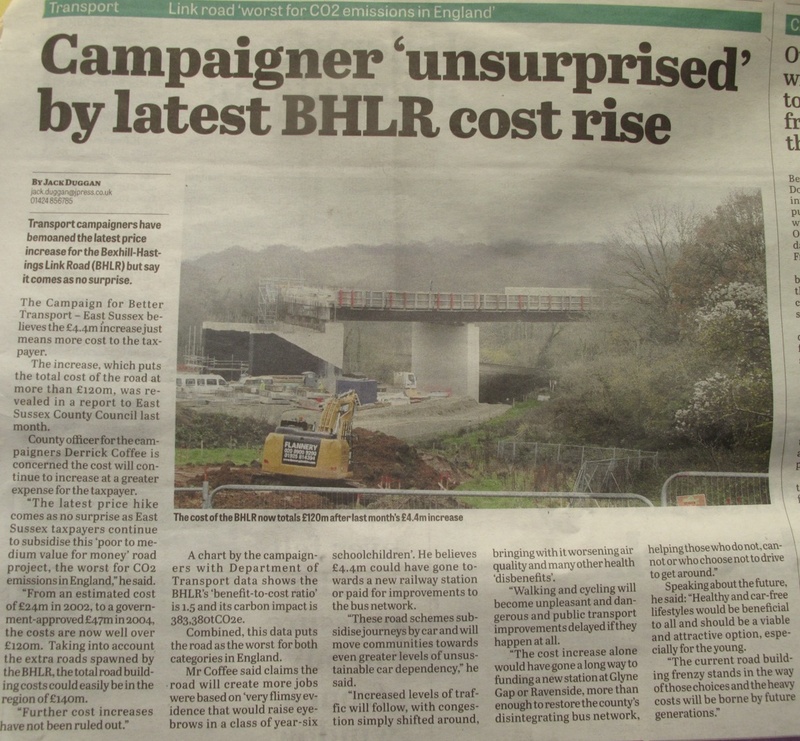 We can contemplate that if those measures had been carried out, they may have caused a few red faces when their success and popularity became obvious and made the BHLR look a bit daft and many, many times more costly for local and national taxpayers. So, what should the mix of high quality alternatives include? Pedestrian and cycling improvements, including a redesign of the arrangements between Hastings station/college and Priory Meadow/Havelock Road. These are dangerous and insulting to pedestrians. Evening and night bus services, with daytime ‘turn up and go’ levels of service at 4 buses per hour between Bexhill and Hastings, and Eastbourne, and at least 2 per hour on Sundays and Bank Holidays . The Conquest and Eastbourne District General hospitals are now central to the needs of residents and visitors of all three towns. Currently evening visitors to the Conquest have a very hard time when it comes to finding buses home. Brighton standards provide a good model with all residential areas provided with 4 buses an hour from the Royal Sussex hospital up to 10 pm. That’s civilised and fair, and helps staff too. Bus lanes: yes, we know they’re coming, but they were said to be coming in the ESCC Local Transport Plan (LTP1) for 2000. They’re long overdue – as is the Quality Bus Partnership route for Ore – Little Common; and one for The Ridge. They were also in the ESCC 2000 LTP1. A railway station at Glyne Gap to serve the retail/leisure services, provide workers with access, give college students a good mix of non-car alternatives, make it easy for young families to have a day at the beach and with improved pedestrian/cycle access, give Pebsham residents a high quality mix of transport choice, and reduce traffic and climate change gas emissions on the A259. All the above would be important pieces in the mosaic of measures that have been resolutely resisted by ESCC for so long to make the BHLR look such a good deal, though not according to the Department for Transport who could only rate it as giving ‘medium to poor value for money’. GIVE A RED LIGHT TO THE RUDD ROUTE! Now here’s a sure route to gridlock! Friends of the Earth ran a campaign over a decade ago on the theme of ‘Better towns: Less traffic’. That principle still holds good. A noisy town choked by traffic and fumes is not a town to linger in and will deter visitors. The pressure of traffic and the degradation of open space taken up by cars cramming in to diminishing space does nothing for a town’s prosperity. It also holds up pedestrians, cyclists and the bus services. The free parking petition set up by MP Amber Rudd will simply lead to more car trips for short distances, choking up local streets and getting in the way of traders, builders, plumbers, electricians and essential service vehicles which do need to get around to carry out their business. It’ll make walking and cycling unpleasant and dangerous, frustrate efforts to create more high quality public spaces where people will want to linger, encourage unhealthy lifestyles, increase emissions of climate change gases and create a negative image of a great town. WARNING! MAJOR ROAD BUILDING SPREE AHEAD. 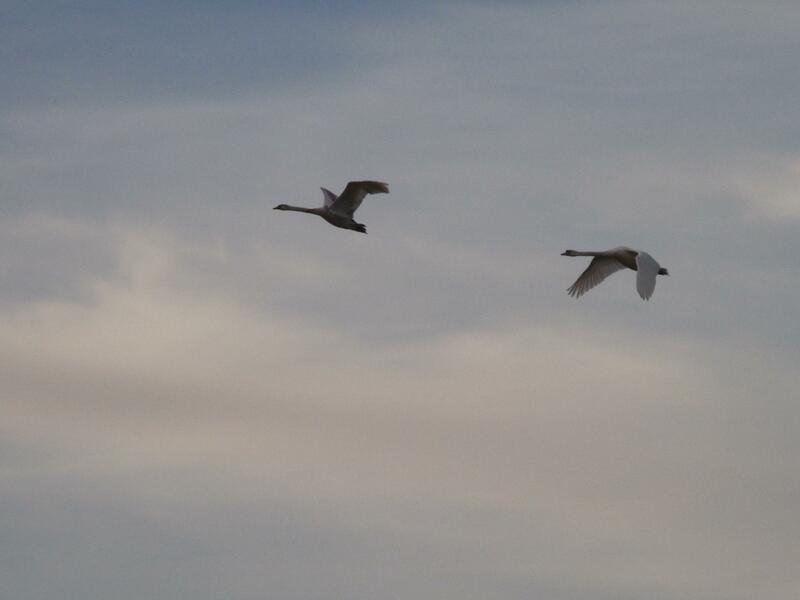 The peace of the valley is recognised by everyone as of value: within such easy (and affordable) reach of so many people: a perfect place to experience wildlife and sense history in a beautiful landscape setting. That combination will be lost. 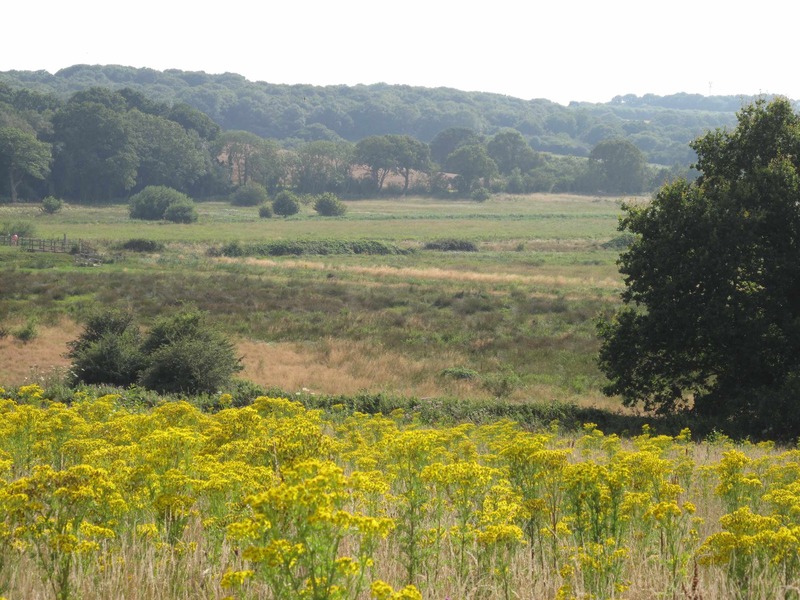 A scheme to ‘offset’ some of the habitat loss will be funded ‘in the Hastings/Brede area’. Of course this is of some value, but no one seems able to tell us where it is. Still, as Owen Paterson MP, Secretary of State for the Environment, tells us, it’s quite an acceptable practice as long as it’s no more than an hour away by car, so cutting off kids from nature. What a cynic and what a cynical ideology. 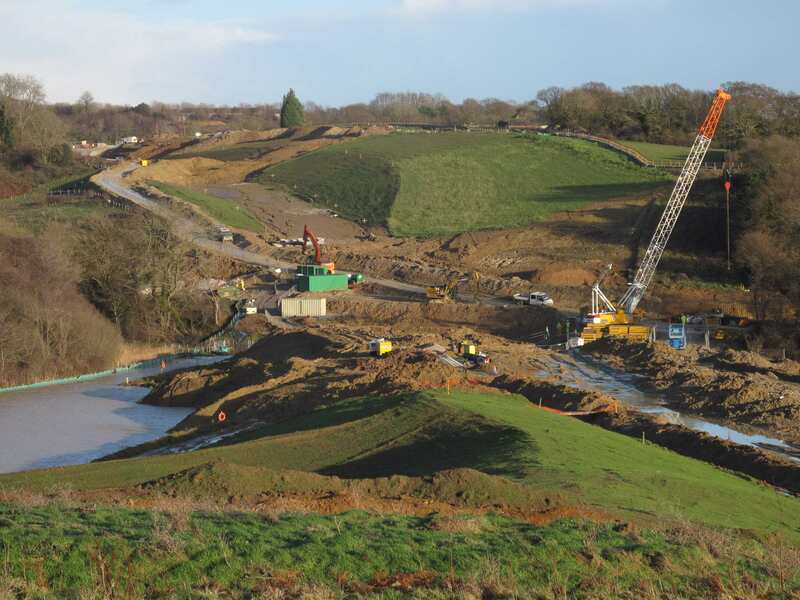 Combe Haven and its smaller tributary valleys are currently being transformed by construction works on a massive scale – and this is only the beginning. Doubtless, many of those who have cherished the experience of walking in these valleys in their lifetimes feel powerless to do anything at all to prevent the progress of the road scheme that will deliver anything up to 30,000 vehicles a day through this exceptionally tranquil and beautiful environment. It is the worst scheme of 45 currently under development in England for CO2 emissions. Minister for climate change and MP for Bexhill Greg Barker is not bothered. It was the second worst of the 45 for ‘value for money‘, and cost increases of £14m since chancellor Osborne’s approval suggest that it’s now bottom. There are no firm strategies for monitoring the environmental mitigation measures. As yet, we don’t know who will do the monitoring or even if it will be carried out. The status, extent and nature of monitoring remain ‘theoretical’. Alternatives were never looked at. The Department for Transport was found by the independent Information Commissioner to be wrong to conceal from the public that immediately prior to the chancellor’s ‘green light’ to approve BHLR funding, a ‘public transport’ based strategy was also on offer to ministers Shocking enough on its own. Despite winning funding for this ‘gold plated’ road scheme, about which there is a great deal of information, there is a lack of information about the range of alternative and sustainable transport options that will be available as (if) the BHLR opens for traffic. There was less than half a page on the subject in the original 200 page bid to government in 2004, and there has been little hard information ever since. Even worse, following a rather secretive and poorly conducted study, Rother District Council want to kill off for good plans for a new station at Glyne Gap. We can only conclude that those without access to a car (including everyone under 17), as well as those who would like to use their cars less, are apparently considered by those designing our future transport networks as somehow of a lower status. That’s disgraceful. The needs of this significant and growing constituency of people must be met and their numbers increased in order to limit the dire effects of climate change. In this respect, the BHLR is the worst possible option, with the consequent car dependent developments eating up scarce land and set to spew thousands of tonnes of climate change gases. John Shaw, long time BHLR fan, advises the Local Transport Board, chaired by former East Sussex County Council leader, Peter Jones. Of the 31 attendees – or would be attendees – 31 out of 33 are male. The parallel Local Enterprise Partnership for the South East is also chaired by Peter Jones and has 40 male and 4 female members. These are very interesting statistics which do nothing to instil confidence in decisions taken. Jobs for the boys? We have to say that the ‘development pool’ process (as highlighted in the report above) produced a far more mature and responsible approach than that being adopted by the new Local Transport Body setup. The environment and sustainability are way down the list. We have been privileged to contribute evidence in support of those of the Combe Haven Defenders tried in court in Hastings in September. Trials continue and there will be more news about their fate and other matters in the weeks ahead.